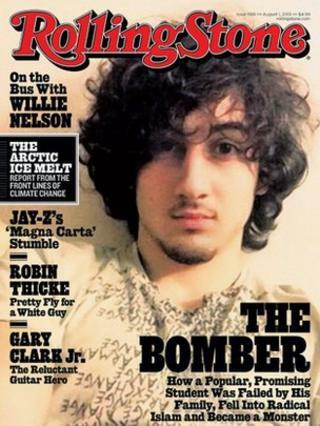 Rolling Stone magazine has defended its new cover story featuring Boston bomb suspect Dzhokhar Tsarnaev, which has prompted uproar. The magazine said a profile of Mr Tsarnaev suited its "commitment to serious and thoughtful coverage". But the mayor of Boston said the publication's cover "rewards a terrorist with celebrity treatment". A number of US retail chains have announced they will not stock the edition. Mr Tsarnaev, 19, pleaded not guilty last week to all charges in connection with the 15 April bombings, which killed three people, including an eight-year-old boy. Janet Reitman, Rolling Stone's contributing editor, spent two months interviewing Mr Tsarnaev's friends and family for the forthcoming issue's article. In a statement appended to the top of the story, the magazine's editors said on Wednesday their "hearts go out to the victims of the Boston Marathon bombing". Had this picture appeared on the front cover of a news magazine, like Time or Newsweek, there would not have been a social media backlash. Indeed, the same portrait featured prominently on the front page of the New York Times in May without controversy. Rolling Stone is different because it's done so much over the decades to shape American popular and celebrity culture. To some, then, a bomb suspect is being depicted as a cultural icon. The sepia-tinted photograph, where Dzhokhar Tsarnaev appears rather dreamy and vacant, looks like a relic from the 70s. Again, it has fuelled criticisms that the magazine is softening, even glamorising, his alleged crimes. This controversy also says a lot about the state of the American magazine market, and the pressure on publications to produce eye-catching and newsy images. This week Newsweek spliced together the portraits of the Florida teenager Trayvon Martin and George Zimmerman, the man acquitted last weekend of his murder. Bloomberg's Businessweek depicted a hedge-fund manager with a graph coming from his groin that intentionally looked phallic. "The cover story we are publishing this week falls within the traditions of journalism and Rolling Stone's long-standing commitment to serious and thoughtful coverage of the most important political and cultural issues of our day," it said. It added that many of its readers are in the same age group as the bombing suspect, and it was important for the publication to explore the issue. But two Massachusetts-based convenience store chains, Rockland and Tedeschi Food Shops, as well as Cumberland Farms, said on Wednesday they would not stock the edition. Two national pharmacy chains, CVS and Walgreens, quickly followed suit. Boston Mayor Thomas Menino said on Wednesday the Rolling Stone was "ill-conceived, at best, and reaffirms a terrible message that destruction gains fame for killers and their 'causes'". Boston City Council President Stephen Murphy said the cover was "disgusting". "Rolling Stone has marketed Tsarnaev as a hero, a misunderstood teen, a product of two incompatible cultures," he said in a statement. "He is not. He is a coward and a murderer who is appropriately facing the death penalty for his crimes." Commentators on social media networks also said the magazine cover was tasteless. Some likened the picture of the suspect, which he posted online himself, to an old Rolling Stone cover featuring Jim Morrison, lead singer of The Doors. More than 15,000 mainly outraged comments were posted on Rolling Stone's Facebook page. Boston punk band Dropkick Murphys, who recently donated $300,000 (£197,000) to victims of the bombings, also expressed their anger. "Rolling Stone you should be ashamed," the band tweeted. "How about one of the courageous victims on your cover instead of this loser scum bag!"